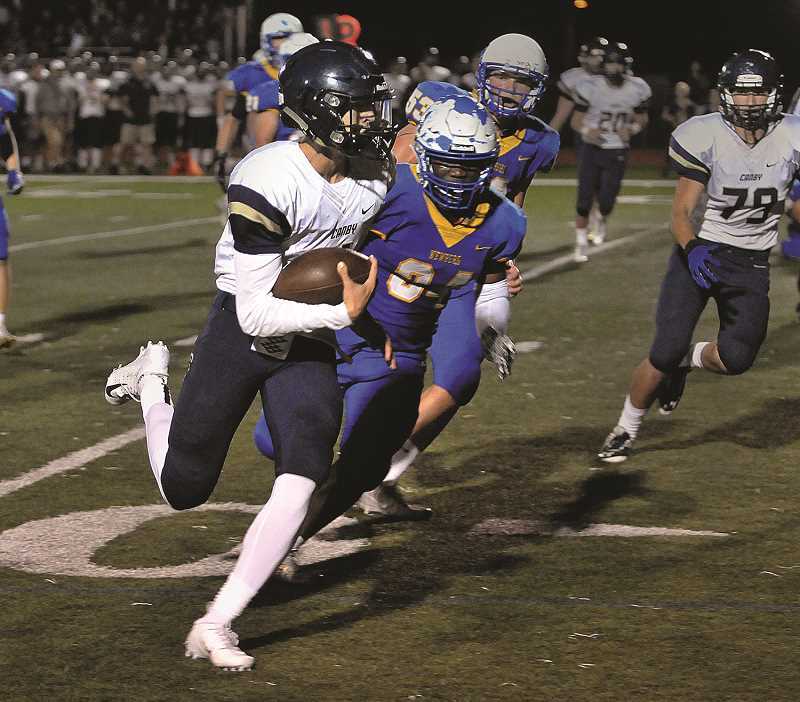 It was a tough loss for the Canby Cougars on Friday, Sept. 21 against the Newberg Tigers. Last year, Canby got a win against the then-Three Rivers League denizen 34-27. The tables were turned this year, though, when Newberg bested the Cougars 20-7. "We battled," Vaught said. "We've gotten better every week. We just can't seem to stay healthy. We're competing our butts off. We just have to find other ways of those kids playing offense and defensive line the entire game. They're just getting beat up and we're asking too much out of them. We don't have many options. But to their credit, our kids competed the whole game. We have great competitors." For the second time in two contests at Loran Douglas Field, the Tigers marched down the field to score on their opening possession of the game, this time getting 59 yards on four carries from Matthew Larson, who scored from two yards out to make it 6-0 5:30 into the opening quarter. Canby had actually stopped Newberg on third down, but chose to accept a holding penalty to push the Tigers back to the 50-yard line. With little to lose, Wright lofted a ball down the right sideline for wide receiver Truman Connelly, who had gotten behind his man. The ball was a bit underthrown, but went off the hands of a Cougar defensive back and directly to Connelly, who race the final 15 yards into the end zone. "Trent had a very good second game of the year running the ball and then he's kind of backed off it," Vaught said. "We kind of challenged him at halftime. You can't force the ball, but if he can get out in the open field, he can do things and take off. And he did. He did a great job running the ball." "We played better in the second half," Wakefield said. "We have to figure out how to do that in the first half." It looked like Canby might storm back into the game after Jayden Brewer intercepted a Wright pass, but sophomore defensive back Armen Tarakhchyan forced a fumble two plays later to stave off that threat. Newberg struggled to move the ball for much of the second half and turned the ball back over on downs to give the visitors one more shot to get back in the game. The Cougars drove all the way to the Tigers' nine-yard line, but a pair of incomplete passes killed the drive. Newberg then killed the clock by feeding the ball to senior fullback Lawrence Lundgren, who rumbled for a pair of first downs to close out the game. For Canby (0-4), which will host Tualatin next week, it was frustrating result after feeling like it came up just a few big plays short of turning the game around. "We had a lot of other opportunities to do things that we didn't get done," coach Mike Vaught said. "All year long we've gotten down inside the 10, but we just don't seem to put it in. We have to find ways to get those scores."